Welcome to an overview of the HoudiniEsq Microsoft Word plugin. Note – The HoudiniEsq Office Plugins are for Windows only. Make sure you have Word 2007, 2010, or 2013. Make sure Microsoft Word is closed. Unzip HoudiniESQForWord.zip file, and then double click Setup.exe to start installation. Installation should only take seconds. Start Microsoft Word, you should see this window pop up for HoudiniESQ setup information. If you have the Outlook plug-in installed already, you may not see this screen. You must specify your HoudiniEsq server URL (see example above), your username, your password and your IRIS password. Ensure that you are entering the entire URL, including the port number if applicable. You will get a confirmation message if setup is successful. Setup is required only once and you should never have to do it again. 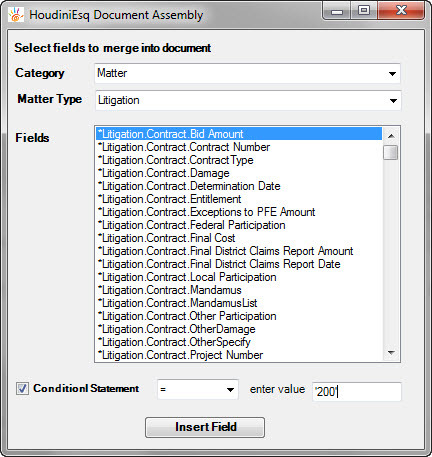 IMPORTANT NOTE: If you are using HoudiniEsq SaaS, you will connect to the following URL: http://houdiniesq.net/ then enter your firm name in the field as shown above..
You will see HoudiniEsq as a option in the MS Word tab (pic is from Office 2010). Here is a breakdown of the options available. First, click the Open option to open a file from HoudiniEsq. 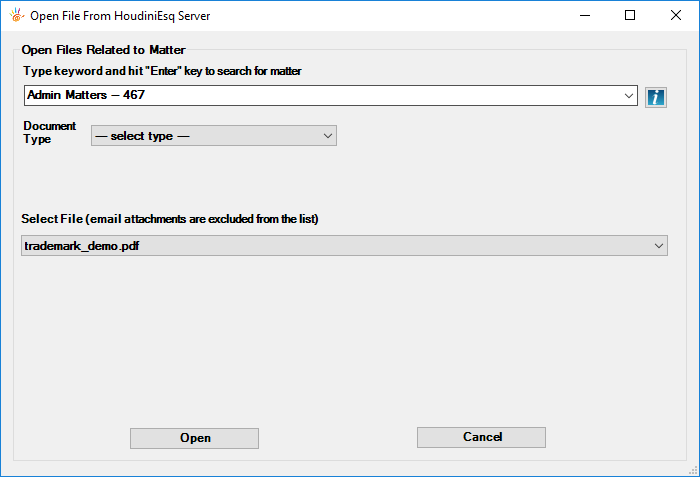 To open a file from HoudiniEsq server, you need to start typing a matter reference and hit “Enter” key to search; the system will return matters that match the searching criteria. After you select a matter form the list, the file drop down list will be enabled with a list of files for the selected matter. Select a file and click Open. Note – you should only open Microsoft Word files. Other file types may or may not be supported. To save a file to HoudiniEsq server, click Save from HoudiniEsq menu. If you initially opened the document with the HoudiniEsq plugin you will see this screen. 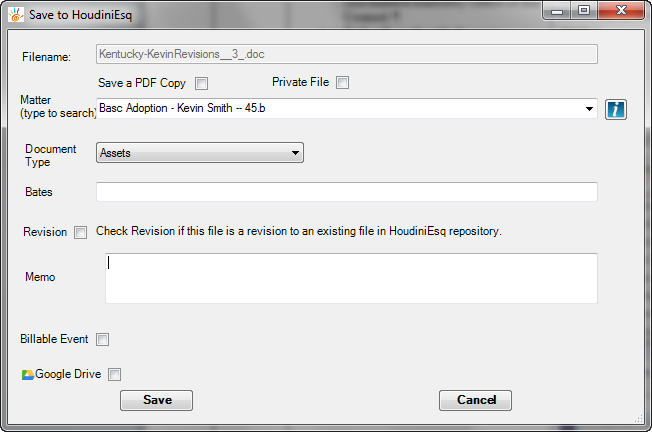 This screen allows you to directly save to HoudiniEsq AND replace an existing document if this an edit. Document Type dropdown is the list of document types available in your system. It will be automatically filled in if the document has a type associated with it. You can create document types in the Setting. Document Subtype dropdown will automatically appear if the selected document type has subtypes defined. 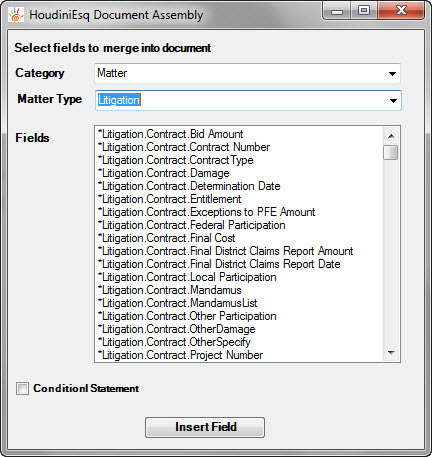 Matter field will be filled in automatically if the file is already linked to a matter in HoudiniEsq. Otherwise, please search for the matter that this file is related to. You can add text in the Memo field. Check “Save a PDF Copy” checkbox if you want the system to automatically save a PDF version of the document on the server. Check “Private File” checkbox if this file is private. Check “Billable Event” checkbox and select a task name and the time you spent if this is a billable event. The system automatically creates a time entry for you. If you have Google Drive sync setup you can sync this document there as well. Click Save to save the file. You will get confirmation if it is saved successfully. If you have access to Word Template feature, you will see the “Manage Template” menu. Templates allow you to insert ‘tokens’ into a Word doc. A token is a placeholder for a particular value. 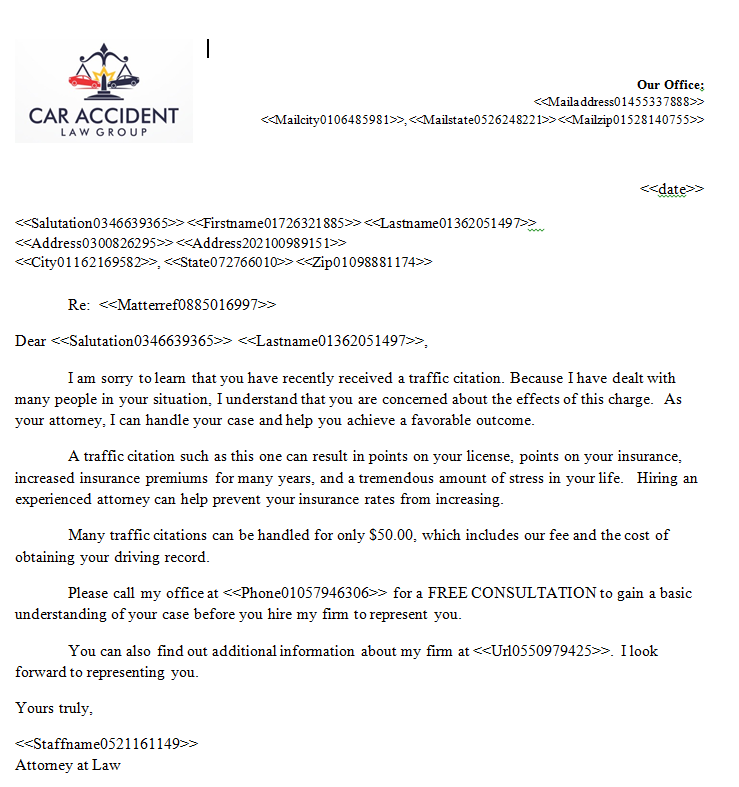 Example ‘Client-first-name’. The Word document allows you to place these token into your document so that these values will automatically be placed in there. To create a template start with either a blank Word document or open an already existing template. Click Insert Field to add tokens. You can drilldown to specific field associated with matters, events, contacts, staff, and more. This includes custom field data too. Additionally, you can also add a Conditional Statement by selecting the field, checking “Conditional Statement” and then selecting your data comparitor, and the result you are comparing. Then click “Insert Field”. Then, simply input the text you wish to display between the <<cs>> and <<es>> tags that are created. If the condition is matched, the text will be shown. A document template will look something like this. When finished, click Save Template to save the template to HoudiniEsq. Select your Document Type and enter a Memo, then click Save. It is not recommended to make templates Private as other Staff will not be able to access them, but the option is available. 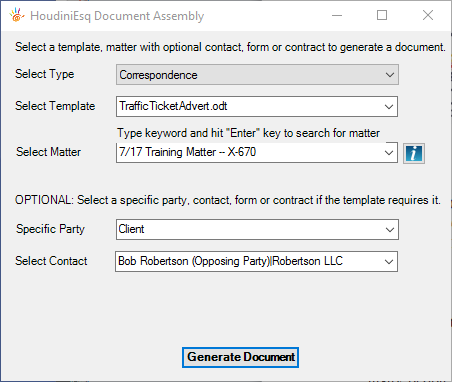 To generate a document for a particular matter using matter specific data from a template, click “Generate Document” button. Select a template from the “Select Template” dropdown, enter and search for a matter in the “Select Matter” dropdown. Click “Generate Document” to generate a matter specific document. If you have lots of templates in the system, you can filter your templates by selecting a template type in the “Select Type” dropdown. Once this generates all tokens will be replaced with actual data from matter (and contact). 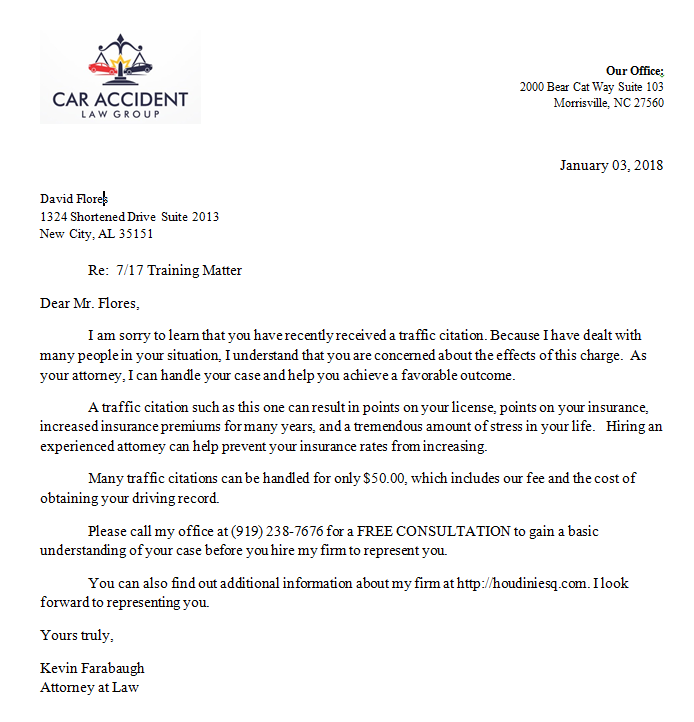 This insurance document will look like this when it is generated with actual data. 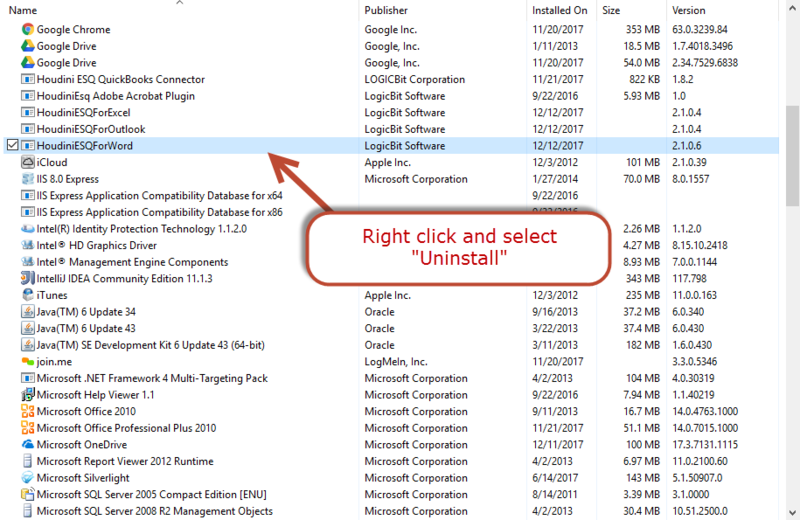 If you want to uninstall the add-in, you need to exit Word, and then enter Windows Control Panel -> Programs -> Uninstall a program, and click HoudiniESQForWord to uninstall.